The last two evenings I worked on making my first tote bag. I found a pattern at All People Quilt awhile back, and it’s been saved on my flash drive for months. I finally decided to take the plunge this weekend and make it. I estimated it would take about 3 hours to finish, so I probably shouldn’t admit that it took me closer to 8 hours to complete. I’m still fairly new to reading patterns, and there are still lots of sewing terms that I don’t understand, so there was lots of ripping of seams and confusion to slow me down. Now that I sorta know what I’m doing, hopefully it won’t take me that long the next time I make one. I never figured out what the pattern wanted me to do with the bottom seams to square off the bottom, so I know it’s not right, but it’s the closest that I got. Also, the pattern never really addressed creating a binding for the top portion, so I did that on my own. Since I usually use this fabric for baby quilts, I was afraid it would turn out looking like a diaper bag or baby bag, and maybe it does resemble one, but I’m still proud of my work and plan to carry it with me to work tomorrow. 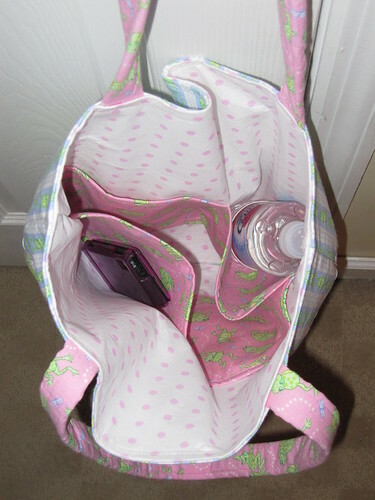 There’s 4 interior pockets. I would love to figure out a way to make one outside pocket on my next attempt at this pattern. 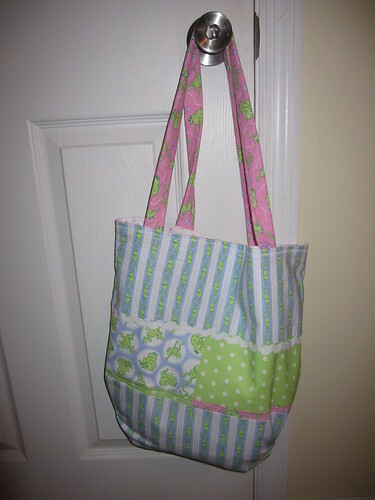 Here’s the pattern for the Easy Breezy Tote Bag at the All People Quilt website. Maybe it was a mistake in naming this blog Adventures in Quilting because lately it seems that I’ve been posting less about quilting and more about other crafts and hobbies….and here I go again. Recently I made my second First Basket. 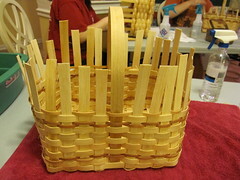 I say it was the second one because a few years ago I had participated in making a Longaberger basket, but really I just helped the Longaberger basket maker…or mostly got in his way. 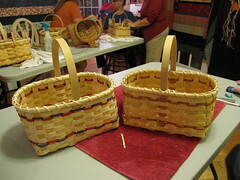 This time I did more of the making of the basket with a little bit of help from my mom and the teacher. 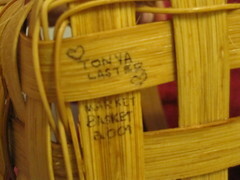 The basket I made is called a Market Basket, and Donna Christian was the teacher. Donna has become a friend of the family in the past year, and offers several other classes in other hobbies like quilting, crocheting, sewing and pretty much anything else if you ask nicely and enough other people are interested in making it a class. Yes, that’s a shameless plug for her! She doesn’t have her own website, but if you live in the Nashville area and interested in her contact information, let me know. 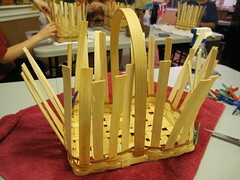 One thing that I discovered early on in making my basket is that there is probably an amnesia involved in the process. 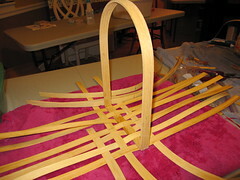 The first part of making the basket was.not.fun.at.all. 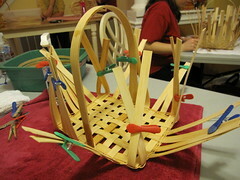 It was complicated, and I can best compare it to trying to dress a siamese twin octopus (because this basket had 15 reed pieces). I can honestly say that if it wasn’t for my mom and Donna’s help, I probably would have given up. 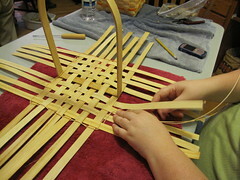 But once a few rows are weaved in, and the basket starts taking shape, the process does become easier and more fun. I just need to get better at remembering to push down the rows and pull the reeds tighter so that it fits together better. When I was done, we dipped the basket in tea mixed with ammonia (oooh, stinky!) 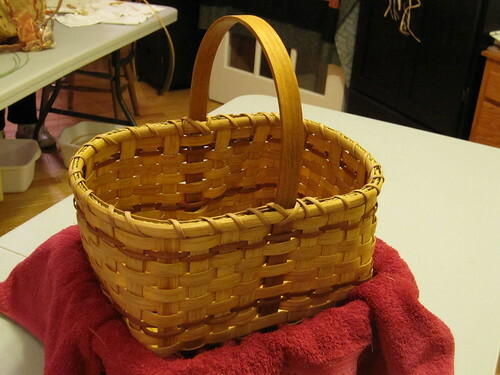 to tea dye the basket instead of brushing on a stain. The next day, we dipped it one more time to make it slightly darker. I really like the darker, more subdued color than the bright unstained color. It’s definitely more warm! 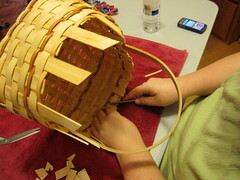 I included just a few pictures from the basket making process in this post. To see all the pictures taken, go to My Flickr link for the complete set. 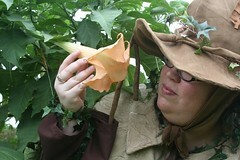 Another non-quilting sewing project that I have put together is a Professor Sprout costume from the Harry Potter movies. 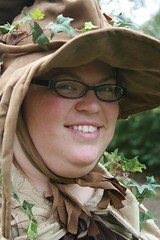 Professor Sprout is the Herbology professor and Head of House for Huffle Puff. 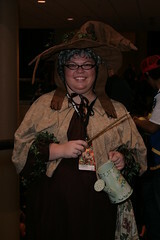 I made the costume for the Dragon*Con convention that I attended Labor Day weekend. This is the first time I have attended the convention, but I was so excited to go, and I wanted to be one of the many participating in wearing a costume. I had lots of help from my mom and friend, Linda. Since I am new to sewing and never sewn a costume or clothing, I couldn’t have done it without them. 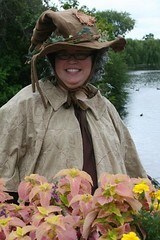 I didn’t make the hat, but I added the ivy to it, and I’m wearing a curly, gray wig, but everything else was sewn. I got very lucky on the fabric by finding it on Clearance at JoAnn for $2 a yard on the dark and $5 a yard on the light. If you look closely on the light fabric, there’s vines and leaves embroidered onto the fabric, which fits with the character so well! 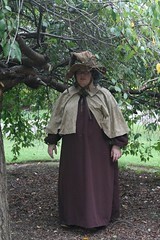 The dark fabric is thick, but it lays just perfect and doesn’t want to wrinkle easily. Oh, and credit goes to my dad for the boots! 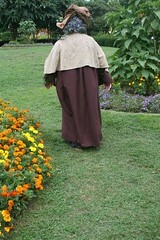 My boyfriend, David, took pictures before Dragon*Con at Centennial Park in Nashville. These were my favorites from the ones he took that day. 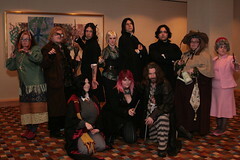 I met up with some other people at in Harry Potter costumes through Cosplay.com and attended a photo session with them at Dragon*Con. Here are just a few favorites of the pictures David took there. 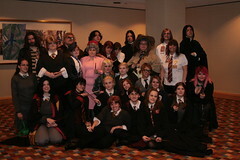 At Dragon*Con, I met an awesomely dressed Dumbledore that I wish I had gotten my picture taken with. I also should have gotten the names and contact information of some of the other costumers, but it was my first Con experience, and I guess I was just overwhelmed with everything going on….and the 35,000+ people there. One thing is for sure, I have been bitten by the costume bug. This is the first post that doesn’t quite involve quilting, but because of my interest in learning to quilt, I have branched out a bit and made this adventure of mine more about sewing and not just quilting. I have a few other non-quilting posts in progress, as well. 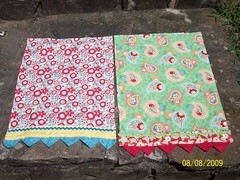 I picked up these kits at The Christmas Goose Quilt Shop in Las Vegas when I was there in April. They were at the checkout counter and so hard to resist for just $5 with their bright and inviting colors. I found out after my purchase that they’re Mary Engelbreit prints, so that explains my attraction to them since I love the colors and designs that Mary creates. I bought one to make for my mom and one to make for myself, but now that I have the pattern, I plan to make several more. They were fairly easy to make, but I learned from a few of my mistakes in the two that I made. I have never sewn with rickrack, and I needed to do a better job tucking in the ends so they don’t ravel. But I suppose that’s what learning to sew is all about…learning from your mistakes and making the next one even better. By the way, this is the first sewing project that I have completed that I have kept for myself. 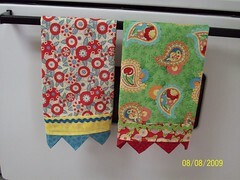 I have a few other projects of my own that I am working on, but so far I’ve given away all of my completed projects. I hope to find the time to make more of these as gifts. 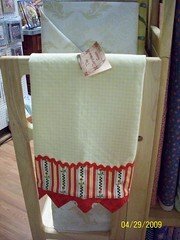 The sample towel in The Christmas Goose Quilt Shop. I wish I had taken a picture of the kits before I put them together.